It’s good to see this blog up and running. This is the first time we’ve written so explicitly about what we’re up to in planning and creating a Zooniverse project, and it’ll be interesting to see how it develops. We’ve normally kept quiet, not out of any desire to be secretive (well, maybe a little – we do enjoy surprising you) but because it’s worth it in order to increase our chances of getting attention from the press. I hope Project IX will demonstrate that we should be more open, more often and that we can talk more about what we’re up to. 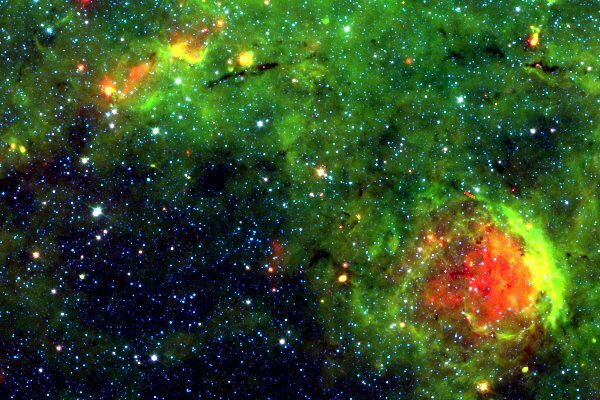 As Project IX involves scanning beautiful images of star forming regions like the one above, it might not come as a surprise that the idea for it came from staring at the data. In conversations first with Grace, from the Adler Planetarium, and then with more and more of the star formation community, there was a real sense that there just *must* be something that could be gained by scanning these wonderful images. Before we could start work on the Zoo, though, we had to be sure that there was a ‘science case’. As I’ve explained over on the Zooniverse blog, our one golden rule is that projects must be constructed so that we can be sure real science will result. In this case, many of the Zooniverse team have been directly involved – Rob and I both wrote PhD theses on star formation (in my case, this was back before I got distracted by galaxies) – but for other Zooniverse projects this has been the responsibility of a team of experts in the relevant field. The criterion is simple : find a task which humans are not only capable of, but better at than existing computer programs. When I give talks about the Zoo, there are often computer scientists or computer minded people who insist that any given problem should be soluble. And many of them might well be – we’re even trying to improve things ourselves – but only after much hard work. We don’t have to beat the ideal machine learning algorithm – with the right incentives and enough money thrown at the problem, even hard tasks like optical character recognition can be solved – but only what’s out there now. Of course, the task needs to be scientifically useful, too. Humans are probably better than computers at solving large jigsaw puzzles, but that doesn’t mean that there’s a Zooniverse project there. There also needs to be enough data to keep all of you busy! If scientists have already reviewed most of the data, or if there wasn’t enough of it in the first place, then there may be little point having a Zoo. By making it easy to launch new projects, the Zooniverse makes smaller projects possible but there’s still a law of diminishing returns. WOW 9 Projects already the ZOONIVERSITY has been Busy! “Scanning beautiful images of star forming areas”? How interesting! There are sure to be discoveries there, and certainly the human eye will see things a computer could never “dream” of imagining let alone seeing.